My Tax Fighting CPA Guaranty is that you will save many times our fee. We guaranty satisfaction! Do you now have a guaranty like My Tax Fighting CPA guaranty? I am very unlike any CPA about which you ever heard or read. To start with, I have appeared on more TV and radio shows, and more written about me in many newspapers, than any other CPA. This covers how hard I fight taxes, how many different ways I fight and how successfully I have long fought. Here is one of several related posts. This YouTube story made me add to my more than 11,000 fighting posts: How Many People Does It Take to Start a Revolution? It says that if 25% of people adopt new norm, then groups follow. One poster doubted few made a difference. This is very contrary to what I read and lived. ANYONE can invent a good product and new way to do things. Writing also can be revolutionary. We dislike change, so it must have benefits. Innovators (2.5%) join change creators. Early Adopters (13.5%) follow. 16% is then a tipping point. Adoption then accelerates, but some resist. I did not let a teacher take my crayons and had daily fights with bullies. I soon lost a second teacher for quickly reading may books and often saying that the teacher and class books were wrong. Selling baseball programs and souvenirs led to many more fights with bullies. I finished a year of college accounting before college. Full time accounting jobs began as a freshman, starting with a large construction company. A switch to night classes soon followed. 9 correspondence hours gave me 21 hours a term. Jobs made me late, so I did not hear of a national accounting exam for seniors. I argued loudly when a teacher told me to leave, not knowing the test was right minus wrong, with each question having several possible right answers. I also lost a third of the test time, but still got a top 1%. No Problem! 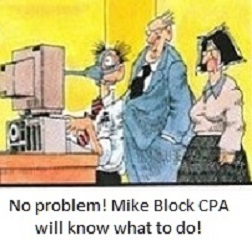 Mike Block, with his Tax Fighting CPA guaranty, will know what to do! I skipped accounting and auditing after college. In 5 years, in national CPA firm tax departments, I did state and city tax returns for a client that visited 20 states, for a few days each. Other clients included many large construction companies. I made many client IRS agents legally justify changes and tracked those with good knowledge. A tax partner then had my agent list typed for all offices’ tax staff. However, I objected when one agent kept showing up for lunch on us. This time the tax partner politely yelled at me. He said the lunch money did not come from my pocket and it was the best investment they could make. He certainly was right about the good investment, as we got a giant refund after the audit. On the other hand, that is why it is no longer legal to pay for an IRS agent’s meal. Like many, it took me some years after I went into my own CPA practice to get many clients. At one point I had a few clients, including one with a major IRS exam, but not enough. Always enterprising, I did per diem work for two CPAs at the same time. Both though I had my own clients for the rest of the time. This made them let me have time off when needed. One of these CPAs said he would sell me his practice, but never got around to giving me a contract. Then New York City passed a gross receipts tax on professional sales. It was a small fraction of a percent (he lived outside the City). The next day he gave me six years of fixed amount notes payable, though CPA practices usually sell for a percentage of collections. However, his price was half of what I expected, so I signed. Before this, I did a tax return of a college friend, who sent me to a neighbor. The neighbor sent me to two friends and they sent me to two more friends, over two years. One of them then sent me to a used car salesman, who send me to a nonprofit that needed a certified audit. Within a week of purchasing the CPA practice, the bookkeeper at the nonprofit got me 5 more nonprofits, which all needed certified audits. A week later a friend asked me to help with the internal work at his very large nonprofit. On hearing about what I was doing, he also got me his nonprofit audit. Then the owners of a fast food franchise added two more stores and needed three audits. All this buried me in work, but there was a gradual shift to construction companies. Specializing in construction, tax audits and tax resolution. I now have a very good partner and my very smart and friendly bookkeeper daughter. They are letting me again concentrate on tax audits, tax resolution and construction. Would you like free Tax Fighting CPA answers? Can I help construction companies or anyone with a tax audit or tax resolution problem?